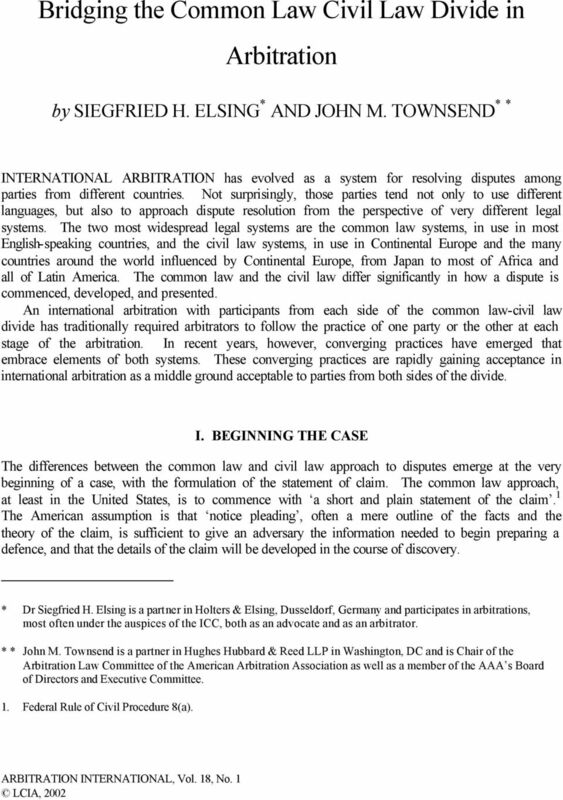 Download "Bridging the Common Law Civil Law Divide in Arbitration"
2 Arbitration International Volume 18 Number 1 2 Continental Europeans, in contrast, expect a case to be fully developed before it is filed. They expect that the initial pleading - the statement of claim in an arbitration - will not only include a full statement of the facts and the law upon which the claim is based, but also that the dossier of documents relied upon will be submitted with it. 2 The concept of filing first, and filling out the details only after obtaining documents in the adversary s possession, strikes most Continental practitioners as reckless and unfair. A converging practice is emerging that parties would be wise to follow when they file a statement of claim before knowing the nationality of their arbitrator. That practice involves telling as much of the story as possible in the statement of claim, not necessarily in the detail of a civil law filing, but more completely than a notice pleading. It also involves attaching to the notice of claim the operative documents relied upon (the contract and any amendments to it, for example) but not necessarily all of the correspondence and other documentation that will be used later to provide context and colour. One test of whether a statement of claim provides sufficient detail is whether the statement and the supporting documents would be sufficient to allow the arbitrator in an ICC arbitration to draw up terms of reference without any other information. Following this practice has several benefits: (1) it allows a party to tell his story convincingly at the beginning; (2) it makes it difficult for the adverse party to claim that it was given insufficient notice of the claim; and (3) it provides the arbitrator with a sense of confidence that all of the important cards have been laid on the table. II. DOCUMENT DISCOVERY The American inclination to look for evidence to support a claim after it has been filed affects more than the initial pleading. 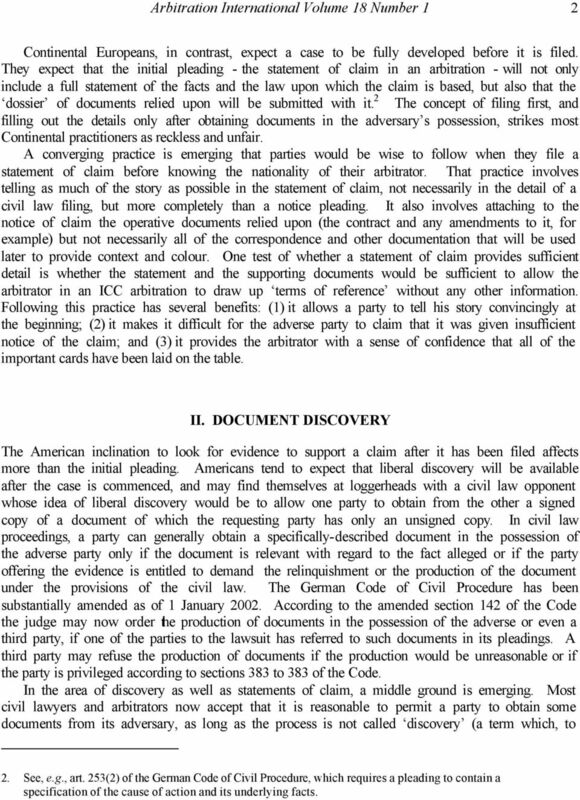 Americans tend to expect that liberal discovery will be available after the case is commenced, and may find themselves at loggerheads with a civil law opponent whose idea of liberal discovery would be to allow one party to obtain from the other a signed copy of a document of which the requesting party has only an unsigned copy. In civil law proceedings, a party can generally obtain a specifically-described document in the possession of the adverse party only if the document is relevant with regard to the fact alleged or if the party offering the evidence is entitled to demand the relinquishment or the production of the document under the provisions of the civil law. The German Code of Civil Procedure has been substantially amended as of 1 January According to the amended section 142 of the Code the judge may now order the production of documents in the possession of the adverse or even a third party, if one of the parties to the lawsuit has referred to such documents in its pleadings. A third party may refuse the production of documents if the production would be unreasonable or if the party is privileged according to sections 383 to 383 of the Code. In the area of discovery as well as statements of claim, a middle ground is emerging. Most civil lawyers and arbitrators now accept that it is reasonable to permit a party to obtain some documents from its adversary, as long as the process is not called discovery (a term which, to 2. See, e.g., art. 253(2) of the German Code of Civil Procedure, which requires a pleading to contain a specification of the cause of action and its underlying facts. 3 Bridging the Common Law-Civil Law Divide 3 most civil lawyers, resonates with all of the positive associations of bubonic plague) and does not permit an adversary to fish for documents that it does not have some reason to believe to exist. This consensus has recently been embodied in a set of rules issued by the International Bar Association called the IBA Rules on the Taking of Evidence in International Commercial Arbitration (hereafter IBA Rules ). Those rules, developed by a committee of lawyers drawn from both traditions, permit a party to submit a Request to Produce to the arbitrator, in which the requesting party may describe documents or a narrow and specific requested category of documents that are reasonably believed to exist and to be in the possession of the adverse party, together with an explanation of how the documents requested are relevant and material to the outcome of the case. 3 That standard may sound restrictive to the American ear, and simply reasonable to an English lawyer, but it is far broader than any Continental civil law system uses for domestic litigation, and represents an important compromise between the perspectives of the two systems. 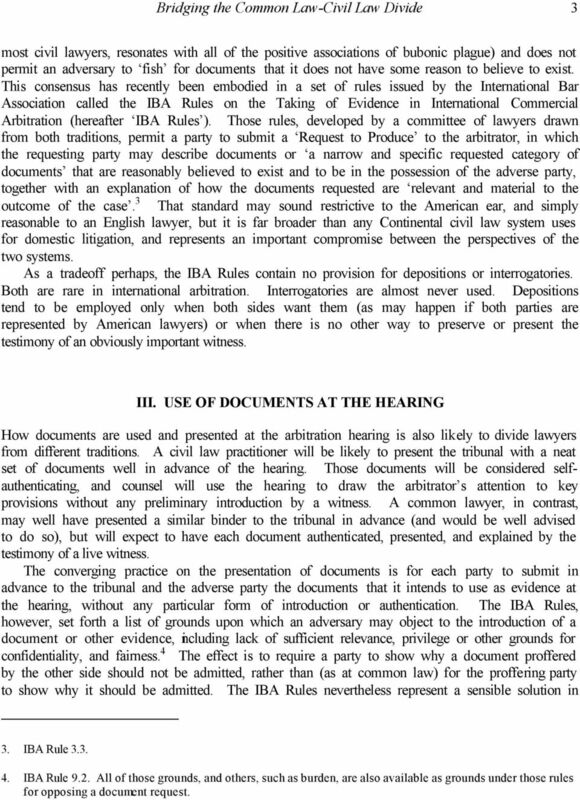 As a tradeoff perhaps, the IBA Rules contain no provision for depositions or interrogatories. Both are rare in international arbitration. Interrogatories are almost never used. Depositions tend to be employed only when both sides want them (as may happen if both parties are represented by American lawyers) or when there is no other way to preserve or present the testimony of an obviously important witness. III. USE OF DOCUMENTS AT THE HEARING How documents are used and presented at the arbitration hearing is also likely to divide lawyers from different traditions. A civil law practitioner will be likely to present the tribunal with a neat set of documents well in advance of the hearing. Those documents will be considered selfauthenticating, and counsel will use the hearing to draw the arbitrator s attention to key provisions without any preliminary introduction by a witness. A common lawyer, in contrast, may well have presented a similar binder to the tribunal in advance (and would be well advised to do so), but will expect to have each document authenticated, presented, and explained by the testimony of a live witness. The converging practice on the presentation of documents is for each party to submit in advance to the tribunal and the adverse party the documents that it intends to use as evidence at the hearing, without any particular form of introduction or authentication. The IBA Rules, however, set forth a list of grounds upon which an adversary may object to the introduction of a document or other evidence, including lack of sufficient relevance, privilege or other grounds for confidentiality, and fairness. 4 The effect is to require a party to show why a document proffered by the other side should not be admitted, rather than (as at common law) for the proffering party to show why it should be admitted. The IBA Rules nevertheless represent a sensible solution in 3. IBA Rule IBA Rule 9.2. All of those grounds, and others, such as burden, are also available as grounds under those rules for opposing a document request. 4 Arbitration International Volume 18 Number 1 4 a context that is supposed to be free of the technical rules of evidence that govern exhibits in common law proceedings. IV. WITNESS TESTIMONY Few differences between common law and civil law procedure are as striking as the attitudes toward the testimony of witnesses. In civil law systems, the judge is expected to have read the dossiers of documents submitted by each party in advance of the hearing. The dossiers may include the written statements of witnesses, or witnesses may appear at the hearing to give an unprompted narrative and to be questioned by the judge. The role of the lawyers for the parties is generally limited to suggesting to the judge questions that should be asked. The idea of a witness being presented by the lawyer for a party in the question-and-answer format of common law direct examination is vaguely distasteful to civil lawyers. And the idea of a witness being required to agree or disagree with statements by a lawyer in the format the common law calls cross-examination is positively repugnant to them. The two traditions differ not only in how the testimony of a witness is presented, but in the weight it is given. The common law tends to be sceptical that the sun has risen unless a witness can be found to testify under oath that he saw it do so. The civil law believes that the best evidence comes from documents. While witness testimony can be crucial to a civil law case, the civil law generally gives far less weight to live testimony than the common law, and treats the testimony of witnesses affiliated with or employed by a party with considerable scepticism. Evidence that a common lawyer expects to clinch his case, such as testimony by the president of a company as to the company s intent, may thus strike an arbitrator trained in the civil law as unconvincing. Conversely, a common lawyer may exert himself to demolish the credibility of witness by a withering cross-examination, only to find that the result is to make a civil law arbitrator sympathise with the suffering of a witness whose testimony would otherwise have been discounted, because it was uncorroborated by a document. These different approaches to witness testimony have also been bridged by converging practices. It is now common in international arbitrations for the entire direct testimony of a party s witnesses to be submitted to the arbitrators in writing in advance of the hearings. 5 This practice has the advantage of shortening the hearing. It also helps to eliminate surprise, and thus serves to some extent as a substitute for depositions of those same witnesses. 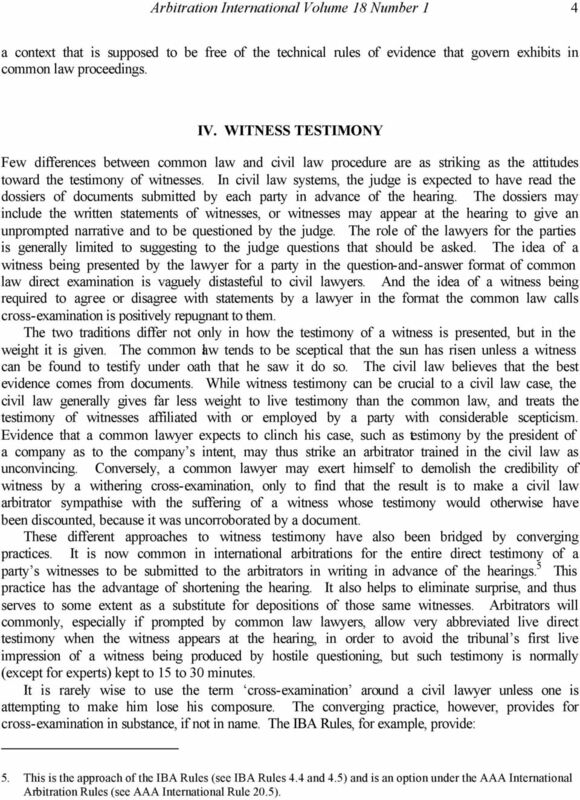 Arbitrators will commonly, especially if prompted by common law lawyers, allow very abbreviated live direct testimony when the witness appears at the hearing, in order to avoid the tribunal s first live impression of a witness being produced by hostile questioning, but such testimony is normally (except for experts) kept to 15 to 30 minutes. It is rarely wise to use the term cross-examination around a civil lawyer unless one is attempting to make him lose his composure. The converging practice, however, provides for cross-examination in substance, if not in name. The IBA Rules, for example, provide: 5. This is the approach of the IBA Rules (see IBA Rules 4.4 and 4.5) and is an option under the AAA International Arbitration Rules (see AAA International Rule 20.5). 5 Bridging the Common Law-Civil Law Divide 5 Each witness who has submitted a Witness Statement shall appear for testimony at an Evidentiary Hearing 6 The Parties may agree or the Arbitral Tribunal may order that the Witness Statement shall serve as that witness s direct testimony. 7 Following direct testimony, any other Party may question such witness The Arbitral Tribunal may ask questions to a witness at any time. 8 Most arbitral tribunals now allow counsel for the parties to question witnesses first, before they ask their questions, if only for the sake of projecting an impression of even-handedness. That impression is generally well served by allowing the parties to ask the difficult questions, and for the tribunal to do so only if the questions asked by the parties fail to bring out the points in which the tribunal is interested. V. EXPERTS There is a key difference between the two traditions in the matter of how the opinions of experts should be made available to the tribunal. 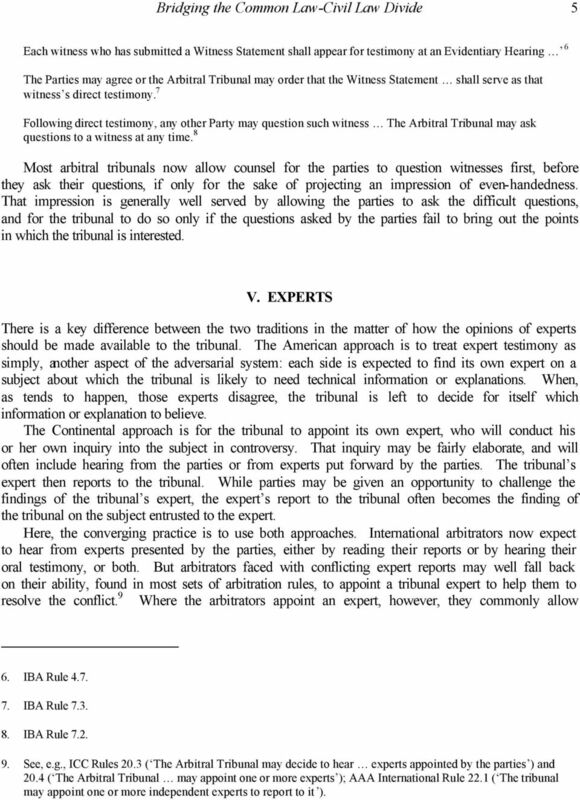 The American approach is to treat expert testimony as simply, another aspect of the adversarial system: each side is expected to find its own expert on a subject about which the tribunal is likely to need technical information or explanations. When, as tends to happen, those experts disagree, the tribunal is left to decide for itself which information or explanation to believe. The Continental approach is for the tribunal to appoint its own expert, who will conduct his or her own inquiry into the subject in controversy. That inquiry may be fairly elaborate, and will often include hearing from the parties or from experts put forward by the parties. The tribunal s expert then reports to the tribunal. While parties may be given an opportunity to challenge the findings of the tribunal s expert, the expert s report to the tribunal often becomes the finding of the tribunal on the subject entrusted to the expert. Here, the converging practice is to use both approaches. International arbitrators now expect to hear from experts presented by the parties, either by reading their reports or by hearing their oral testimony, or both. But arbitrators faced with conflicting expert reports may well fall back on their ability, found in most sets of arbitration rules, to appoint a tribunal expert to help them to resolve the conflict. 9 Where the arbitrators appoint an expert, however, they commonly allow 6. IBA Rule IBA Rule IBA Rule See, e.g., ICC Rules 20.3 ( The Arbitral Tribunal may decide to hear experts appointed by the parties ) and 20.4 ( The Arbitral Tribunal may appoint one or more experts ); AAA International Rule 22.1 ( The tribunal may appoint one or more independent experts to report to it ). 6 Arbitration International Volume 18 Number 1 6 the parties the opportunity to question him after he has submitted his report. 10 They may also allow the parties to call their own experts to take issue with the views of the tribunal s expert. 11 VI. LEGAL ARGUMENT The common and civil law traditions also differ in how legal arguments are developed and presented. Common lawyers tend to submit briefs citing the authorities they rely upon and explaining their legal arguments in detail. They then concentrate only on the key points, and on questions from the tribunal, in oral argument, which may follow an entirely different order than the brief. Moreover, the authorities considered convincing by a common lawyer, in addition to statutes and treaties, tend to be decisions by courts resolving cases with similar fact patterns. The civil lawyer, by contrast, will expect to appear at the hearing with a detailed outline of the points he intends to make, complete with citations to relevant authorities. He will offer these pleading points to the tribunal either at the beginning or at the end of his oral argument, which will scrupulously follow the outline. Pleading, it should be noted, means to the civil lawyer this presentation of legal arguments, not the statements of claim and defence exchanged at the beginning of the case. 12 Moreover, the authorities that the civil lawyer will cite as convincing, after the relevant provisions of the code, will tend to be commentaries on the code provisions by professors of law or other noted commentators, not decisions by the courts. Here, the converging practice tends to be accommodating to both traditions. Arbitrators will generally accept written legal arguments in whatever format the parties proffer them, whether as briefs or as pleading notes, and will generally listen to whatever style of oral argument the lawyers wish to present. 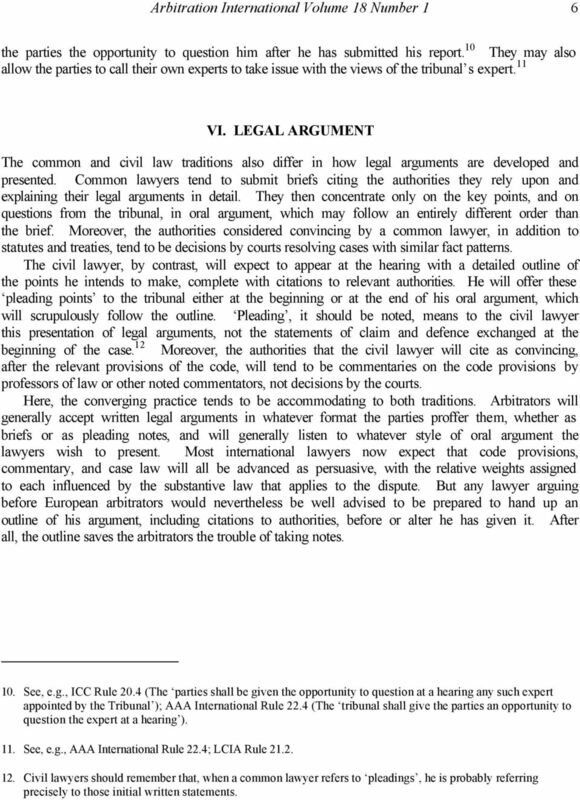 Most international lawyers now expect that code provisions, commentary, and case law will all be advanced as persuasive, with the relative weights assigned to each influenced by the substantive law that applies to the dispute. But any lawyer arguing before European arbitrators would nevertheless be well advised to be prepared to hand up an outline of his argument, including citations to authorities, before or alter he has given it. After all, the outline saves the arbitrators the trouble of taking notes. 10. See, e.g., ICC Rule 20.4 (The parties shall be given the opportunity to question at a hearing any such expert appointed by the Tribunal ); AAA International Rule 22.4 (The tribunal shall give the parties an opportunity to question the expert at a hearing ). 11. See, e.g., AAA International Rule 22.4; LCIA Rule Civil lawyers should remember that, when a common lawyer refers to pleadings, he is probably referring precisely to those initial written statements. 7 Bridging the Common Law-Civil Law Divide 7 VII. CONCLUSION It is unlikely that the common law and civil law approaches to advocacy and proof will ever fuse into a single set of procedures for international arbitration. Nor is it desirable that they should. One of the great strengths of arbitration is its procedural flexibility, which permits the process to be tailored to the particular needs of each case. What is emerging is rather a consensus as to a range of procedural options available to the arbitrators and the advocates in each proceeding. While not every procedure in that range will be accepted in or is suitable for every arbitration, there is increasingly widespread acceptance of this range as defining a set of procedures that are unlikely to be challenged as unacceptable or unfair by parties from either side of the increasingly less divisive common law - civil law divide. Legal Ethics in International Practice Andrew Melsheimer Thompson & Knight LLP Needs natural gas to feed chemical plant Has excess natural gas Photo by Tod Baker, available at flickr.com Let s make a deal! TOC INDEX AGRICULTURE, FOOD AND RURAL DEVELOPMENT Working with Your Lawyer Keith Wilson Introduction The cattle industry is becoming more complex as production techniques and market opportunities evolve. THE COST ENGINEER AS EXPERT WITNESS -- ARE THERE ANY RULES?